Happy weekend everyone! Today's look is on another Kpop music video, SNSD aka Girls Generation's "The Boys". When I first saw this video, I was instantly drawn toward Tiffany's gold glittery eye makeup with milky pink lips and fun lower lashes. I haven't worked with glitters in a long time so it seemed really appropriate with the upcoming holidays. I hope you guys enjoy watching! So I'm actually a bit surprised at how well the brown eyebrows worked for this look because I normally would only fill my brows in with an ash grey! It seems to warm up the whole face and plays off of the gold glitter nicely. Also, if the lower false lashes are too long for you, then you should try cutting them a bit shorter and only wearing them near the outer corners of your eyes. I snipped the inner 2 slightly shorter to look more natural as well. Thanks so much for watching/reading and let me know in the comments the next look you'd like to see! Beautiful as always Jen. I love the eye look and how the bottom lashes looks so cute! Thank you so much for this post! Beautiful! I am gonna try this one day! you look gorgeous! as always! I don't know who the other girl is but you're so much prettier than her! Love your looks & style! I really like your version of make-up. I will be really happy to know how to do make-up of girl in 2:05.
dear jen, u never fail me!!!!!! i love2 ur brows dis time. i wanna have mine like urs! how how??? PS: How do you do to keep the lower lashes all day? Because I can't as my eyes get teary sometime, causing the glue to smudge and the lashes to fall. If you have a tip I'll be more than thankful! pretty as always :) great tutorial! Your beauty makes you more than qualified to become a Korean actress! I heart you! nice makeup tutorial as always jen!!! i really love your blog!!! You look more beautiful Tiffany .. I love sparkling eyes still full of mystery. I hope you will draw the eye guidance as Ji Yeon is the latest mv Cry Cry (T-ara). Thank you very much! "Bring the boys out"... so cute! Great job! You're so talented!! WOW your so talented! Looks great! Beautiful as always! Your version looks even better than the video! An amazing transformation! So Stunning! your transformation is crazily amazing! You are such an artist and amazing with your hands and of course, with makeup. That makeup looks gorgeous! Very well done! You could be twins. You both are gorgeous! You make putting makeup on so easy. What a great song. And your tutorial is great as always. You look really pretty. And I love to hear your voice! amazing! you look just like her in the video, so so so pretty! are the NYX glitter long wearing? how do you prevent them from falling out? oh my gosh how do you get the makeup look so perfectly?! gorgeous as usual jen!! :) btw what editing program do you use? your pictures are fantastic! Loving ur brown brows Jen! What kind of eyebrows pencil do you use this time?! amazinggg :) absolutely love this! Klorane Dry Shampoo - You've reviewed so many dry shampoos except for this one, yet it's won so many consecutive Allure Magazine Best of Beauty Awards. SK-II Facial Lift Emulsion - You often comment that you're skin can get quite dry, but is also prone to breaking out. Well, this is oil-free (non-comedogenic) and super moisturizing. Plus it contains Pitera, which is used to make Sake and is anti-aging. It's normally quite expensive, but I get full-size bottle on Sasa.com for around $90. Wow, this look really works! The eyeshadow really works well with the whole look. you always take such nice pictures! The MV is so cool and girly, love it! hi Jen can you please do a basic '10 must haves' in a wardrobe,and makeup products? I wonder if you could do some double lids toturials!!! Also, can you share with us about your facial waxing tips?? 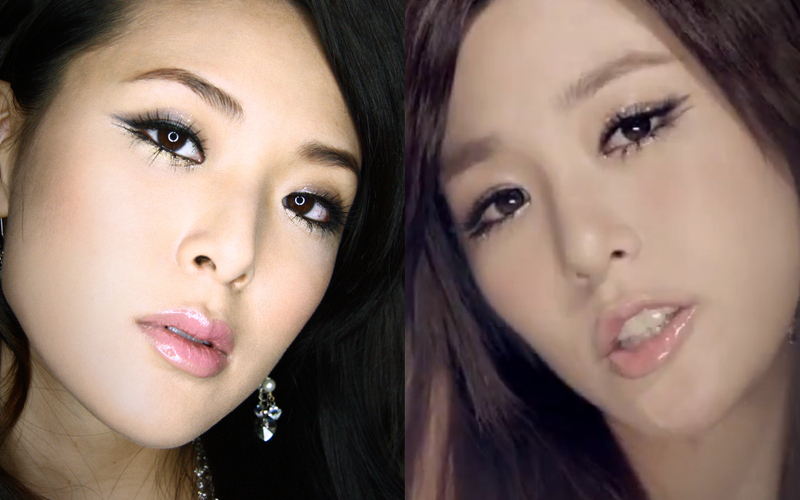 I am korean as well amd it is really hard to do it like the way korean celebreties looks like.. Thank you so much and I really loved the lastest look and also your brow toturial!! Can you do a Jiyeon inspired look? I LOVE T-ara and she's always so pretty. Pretty and great, as always! Looks great, I almost like your version better! How did you figure this out? You look stunning. Hi Jen, thanks for this. I wore this look for holiday parties and I was so inpired by this I made my own version of the look. Sept Oct 2011 Hits & Misses!